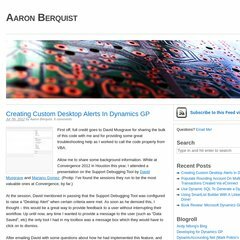 Topics: Dynamics Gp, Dynamics Gp Tables, Econnect, and Multicurrency. aaronberquist.com Troubleshooting Upgrade to GP 2010 R2 | Aaron Berquist - High ..
aaronberquist.com Tool for Improving "Mark All" Speed in Contract Administration ..
aaronberquist.com Review: Dynamics GP 2010 Implementation by Victoria Yudin | Aaron ..
aaronberquist.com Rounding Account On Multicurrency Payables Trx via eConnect .. It is hosted by Bluehost Inc (Utah, Provo,) using Apache web server. Its local IP address is 66.147.244.203. Its 2 nameservers are ns1.bluehost.com, and ns2.bluehost.com.